Petition Delivered; G7 Leaders Call to Cancel Haiti’s Debt! 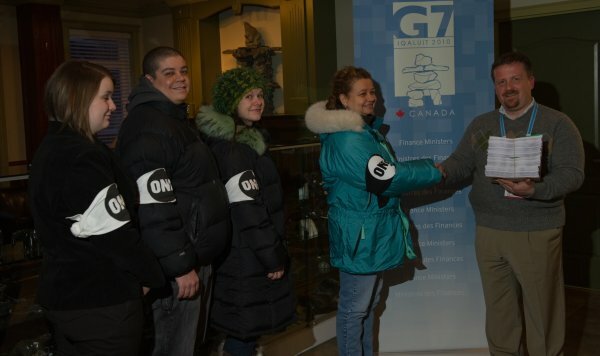 Michèle Bertol, a Haitian Canadian and ONE member, hands over the petition urging the cancellation of Haiti’s debt to Canadian Finance Minister James Flaherty’s Chief of Staff, Derek Vanstone, at the G7 finance ministers meeting in Iqaluit, Canada. Michele is joined, from left to right, by fellow ONE members Vanessa Griffin, Jean-Sébastien Icart and Erin Faulks. Thanks to the more than 400,000 who signed the petition worldwide, the cancellation of Haiti’s debt may be all but a formality at this point. Yesterday afternoon, four ONE members delivered the petition signatures to cancel Haiti’s debt at the G7 finance ministers summit in the small Arctic Canadian town of Iqaluit. The petition was signed by over 200,000 ONE members and nearly 200,000 Avaaz members globally. Haiti debt petitions from Oxfam International and Jubilee were also delivered. The petition was handed over by Michèle Bertol, a Haitian Canadian and ONE member who is the director of planning for Iqaluit and who has lived in the town for 20 years. “The earthquake caused unprecedented damage that requires exceptional measures. We agreed that the debt should not be a burden that will weigh on the recovery of the country. We are committed in the G7 to the forgiveness of debt. In fact all bilateral debt has been forgiven by G7 countries vis-à-vis Haiti. Though the $1 billion in debt is still not yet technically cancelled, the G7 countries (the United States, Canada, United Kingdom, Germany, France, Italy and Japan) hold considerable influence over the international lending institutions that must ultimately and officially cancel Haiti’s debt. We at ONE now feel confident that the full cancellation of Haiti’s debt is closer to being a done deal than ever before — and we hope the details will be hammered out quickly. And it’s all thanks to the hundreds of thousands around the globe who stood up for the people of Haiti to make this happen. Thank you!